Roaming the halls of the IFA tech conference in September, we were immediately charmed by this eye-catching pixel art display. On closer inspection, it turned out to be the front of a Bluetooth speaker which hooks up to your iPhone or Android smartphone via an incredibly feature-packed app. It can play music, display the time, alert you to incoming notifications on your phone, and a whole lot more. Best of all it can be customized to show any retro pixel artwork of your choice – including your own creations. Dig into our Divoom Timebox Mini review to learn about the full potential of this delightful Franken-gadget. The Timebox Mini is a plastic box measuring 3.5 inches wide and about 1.5 inches thick. The front sports an 11 x 11 chunky pixel display with a thin bezel. On the back, you’ll find a speaker grille with a Micro USB charging port at the bottom, flanked by two standard 3.5mm jacks for input and output. Up top, there are volume controls and a play/pause button. On the right side, you’ll find the power button and a cycle button that goes through a few different functions. On the bottom, there are tiny rubbery feet to give it some space between your desk or nightstand. 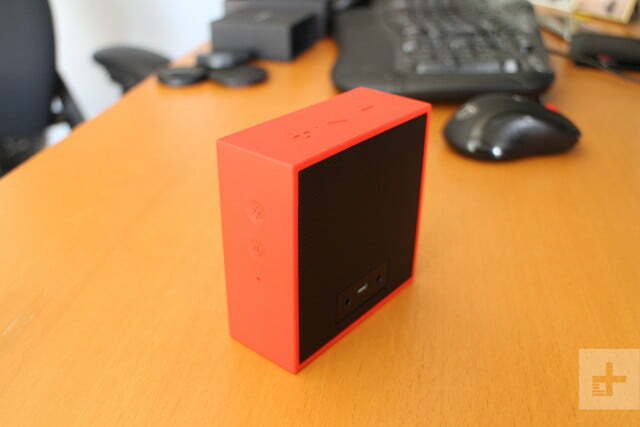 The Timebox Mini is very light and highly portable. It comes in a range of different colors including black, red, white, pink, blue, green, and teal – our review unit is red. To use your Timebox Mini, you download the app for Android or iOS and pair your smartphone via Bluetooth. It’s quick and easy to set up and the app is absolutely packed with functionality. 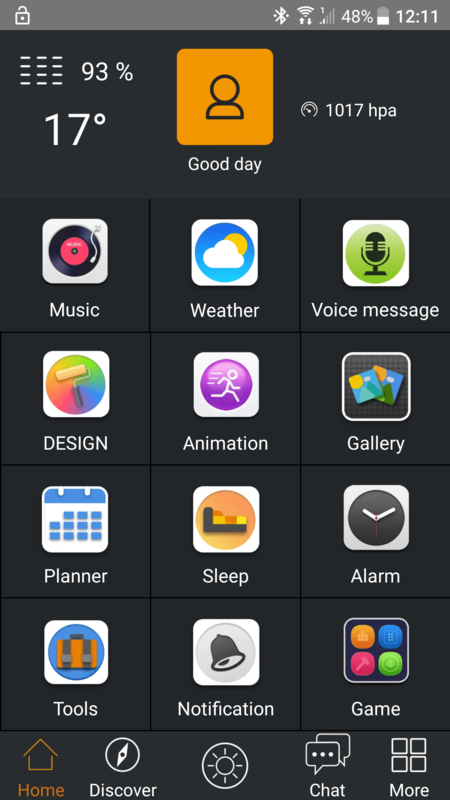 You can tap into weather, calendar, clock, or alarms. You can choose from an extensive gallery of existing artworks and animations, or create your own (more on that in a moment). You can even have your Timebox Mini show notifications from your phone, for example, flashing up the Facebook or Twitter icons when you have incoming alerts or informing you of incoming calls and emails. It’s fun to get animated pixel art with your music. We were excited at the idea of it matching animations to music, but sadly it doesn’t work with streaming services, only with the music you have stored on your phone in MP3 format. There’s even a sleep function that plays supposedly soothing sounds — some are, some aren’t — with matching colors for a chosen length of time to help lull you off the sleep. The kitchen sink approach continues with the option to display block colors, play games, use it as a stopwatch or scoreboard, or even chat through it with text and voice messages. This last function requires you to create an account and connect with a friend who also has a Timebox Mini, but it means you could send a message and have it display on the Timebox Mini on their desk at work. The feature attraction here is obviously the pixel art display. Originally, pixel art popped up in old 2D video games where graphics were severely limited. Talented artists used individual pixels as building blocks to make up a recognizable image, a bit like a mosaic. 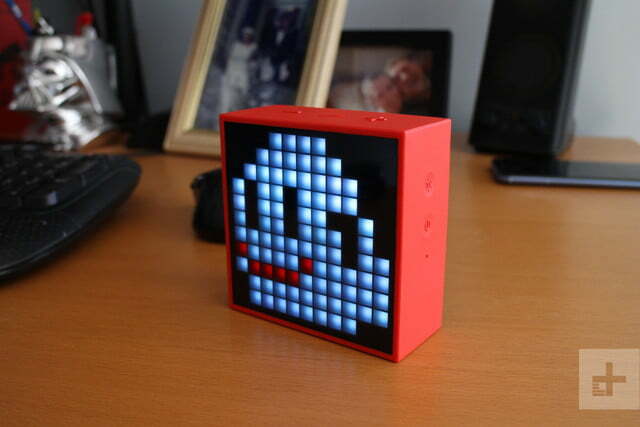 Even though graphical capabilities have moved on, pixel art is still hugely popular and the Timebox Mini is a great way to dip into it. This is a great little gift that’s impressively versatile and genuinely fun. 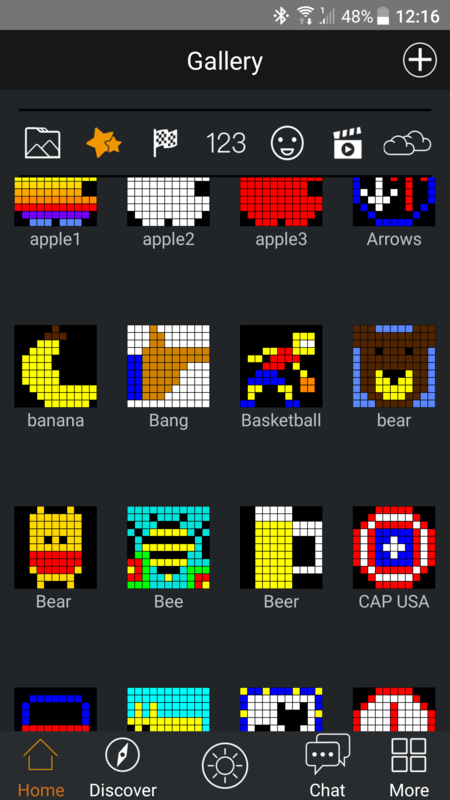 Go into the design section of the comprehensive app and you can create your very own artworks pixel by pixel. There are a few block colors to choose from, or you can use the RGB slider to get the exact tone you want. Then it’s a simple case of tapping the individual pixels to light them up. Once you’re done you can save your creations or share them. There are lots of artworks available in the app that other users have created and uploaded. If you’re anything like us you already have a scattered tribe of Bluetooth speakers in your home and, to be honest, there’s nothing special about this one on the audio front. It features a 5W 2-inch driver that’s plenty loud and clear enough for use as an alarm clock or speakerphone. It can also fill a small room with music, but it obviously lacks the range and quality of something bigger. Check out our picks for the best Bluetooth speakers if you’re an audiophile. We’re excited by the prospect of technology like the Tempow Audio Profile inside the forthcoming Moto X4, which allows you to simultaneously connect to four Bluetooth speakers and play perfectly synced audio through them. 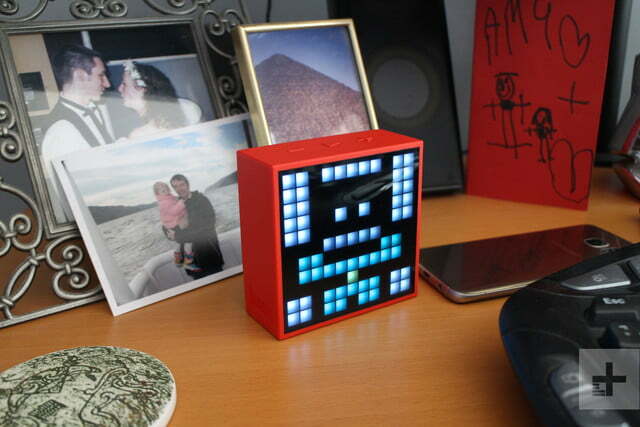 That could be a great way of getting more use out of Bluetooth speakers like the Timebox Mini. There’s a 2,500 mAh battery inside that’s good for around 10 hours of music playback, but it will obviously drain faster if you’re using the LED display. We found it lasted a full day of mixed use with plenty left in the tank, so charging every few days should be enough. It comes with a Micro USB to USB cable, but you’ll have to provide your own wall charger. Tap the power button once and you’ll get a remaining power display in the shape of a battery icon. When it does run out of battery, you can charge it fully back up again in around three hours. 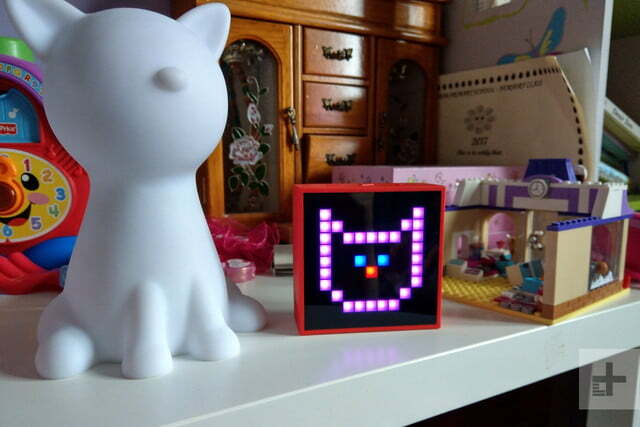 Kids absolutely love the Timebox Mini and it’s the sort of device that can slot into any environment because it’s so customizable. 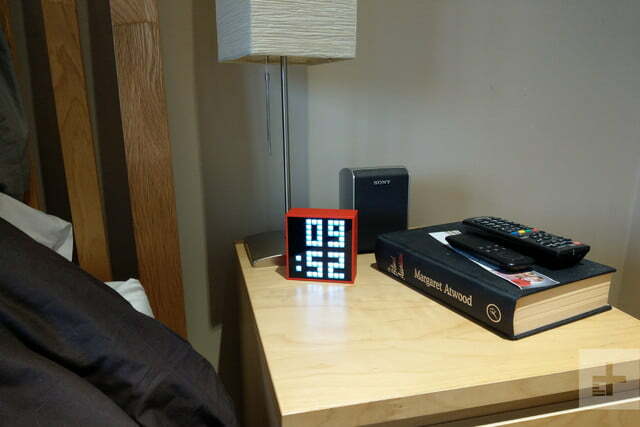 It works well as a fun desk toy or a retro alarm clock. Some people will like the notifications and speakerphone functionality. Others will just enjoy creating space invaders or watching it animate in time to their music. Put two together, and you have a super cute, unique way of communicating. 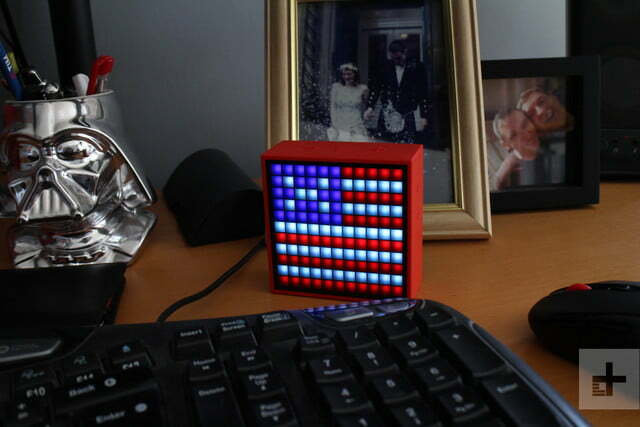 The Timebox Mini costs $60 right now on Amazon and we think it’s well worth it. This is a great little gift that’s impressively versatile and genuinely fun.